January 3, 2017 – Disaster Restoration Services (DRS), a member company of DKI, North America’s largest disaster restoration contracting organization, announced that its team worked with Sal’s Clothing Restoration for the second consecutive year to sponsor the annual Button up Connecticut coat drive for those throughout Connecticut in need of winter clothing. Together, they gathered and dry cleaned 505 coats for Button Up Connecticut. Button Up Connecticut is an organization that collects coats from various donors and distributes them to those who are in need throughout Connecticut. It was started in 1992 by Siracusa Moving and Storage Owner Dan Siracusa when he heard that on colder days of the school year, fewer children in CT came to school since they did not have the proper winter gear. According to GOBankingRates, CT came in at number 9 on the top 10 list of the most expensive states to raise a family. With the high taxes, cost of living, and the ever changing New England climate, raising a family in Connecticut can surely be a struggle. DRS and Sal’s reached out to local companies about Button Up Connecticut, and set up donation boxes at their properties. The businesses that brought in the most coats were awarded by having donations made in their names. The first place winner was Bouvier Insurance from West Hartford, CT, with 47 coats donated, awarding them a $300 donation in their name to the Connecticut Food Bank. 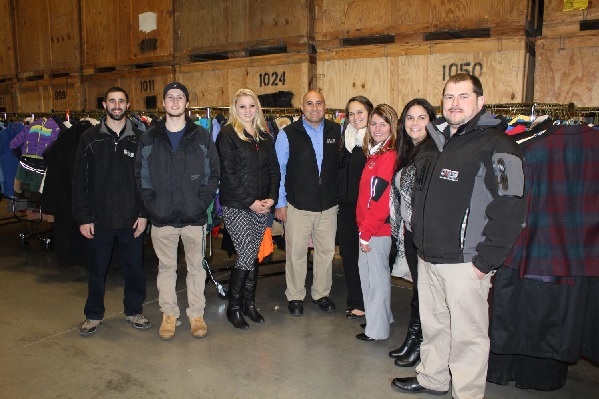 The Michael Keating Insurance Agency from West Hartford, CT came in second place with a donation of 40 coats, awarding them a $200 donation in their name to the Salvation Army. State Farm Agency-Anne Coppola from Ansonia, CT earned third place, donating 34 coats, awarding them a $100 donation in their name to the Connecticut Humane Society. To learn more about the organization, visit www.buttonupconnecticut.com. Button Up Connecticut’s mission is to collect clean, new and gently used coats and distribute them to residents in need all across Connecticut. The coats are received from individuals and various companies, schools, churches and other organizations throughout the state, who run their own coat drives and donate the coats they receive to Button Up Connecticut for distribution. The coats they collect are provided to local non-profit agencies (schools, churches, children’s homes, shelters, food pantries, and other social service agencies) by appointment only for distribution to their clients. Agencies can set up appointments to get coats for their clients by emailing Kara Lucht at [email protected] or calling the Button Up Connecticut Hotline at 860-259-0239. Siracusa Moving & Storage has been helping New Britain families and businesses move across town and across the country for more than 25 years. Family-owned and operated with several affiliates nationwide, helps them provide their customers with high-quality moving services at affordable prices. For more information, visit www.siracusamoving.com or call (860)-225-9144.